Join us for a fun evening as we kick-off Starr Hill Roanoke Pilot Brewery & Side Stage’s #CheersForCharity month to benefit SARA Roanoke! 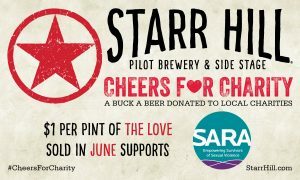 Each pint of Starr Hill’s The Love Wheat Beer sold throughout the entire month of June generates $1 to SARA to support survivors of sexual violence. SARA Roanoke will be on site with great information and fun swag, so make sure to stop by our table and enter yourself for a chance to win a SARA Swag Bag! And stay tuned for more great events and opportunities to support SARA throughout June!